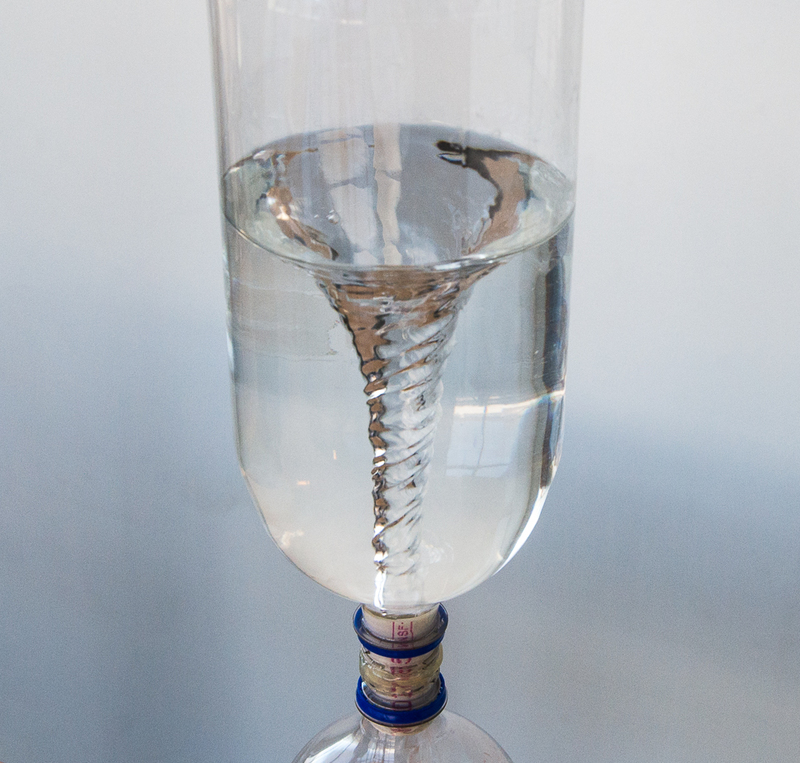 Water forms a spiraling, funnel-shaped vortex as it drains from a 2-liter soda bottle. A simple connector device allows the water to drain into a second bottle. The whole assembly can then be inverted and the process repeated. Fill one of the soda bottles about two-thirds to three-fourths full of water. For effect, you can add a little food coloring or some bits of paper or glitter to the water. Apply a small ring of glue around the top of the mouth of the same bottle (some of the glue will get on the PVC pipe, but that's okay), then immediately push and rotate the empty bottle onto the end of the pipe until the mouths of the two bottles meet (or come as close as possible) to form a glue joint. Apply some additional hot glue to seal the joint where the two bottles meet. After the glue dries, proceed to the To Do and Notice section. If the bottles leak when you are using them, use a paper towel to dry off the area where the mouths come together and apply more hot glue there to obtain a better seal. Orient the connected bottles so the filled bottle is on top and upside down, then set the assembly on a table. Watch the water slowly drip down into the lower bottle as air simultaneously bubbles up into the top bottle. The flow of water may come to a complete stop. With the filled bottle once again on top, rapidly rotate the bottles in a circle a few times. Observe the formation of a funnel-shaped vortex as the bottle drains. Notice the shape of the vortex. Also, notice the flow of the water as it empties into the lower bottle. If you only have one 2-liter bottle, you can still make a vortex by twirling the bottle and holding it over a water basin or the ground to drain, but you will have to refill the bottle each time you use it. 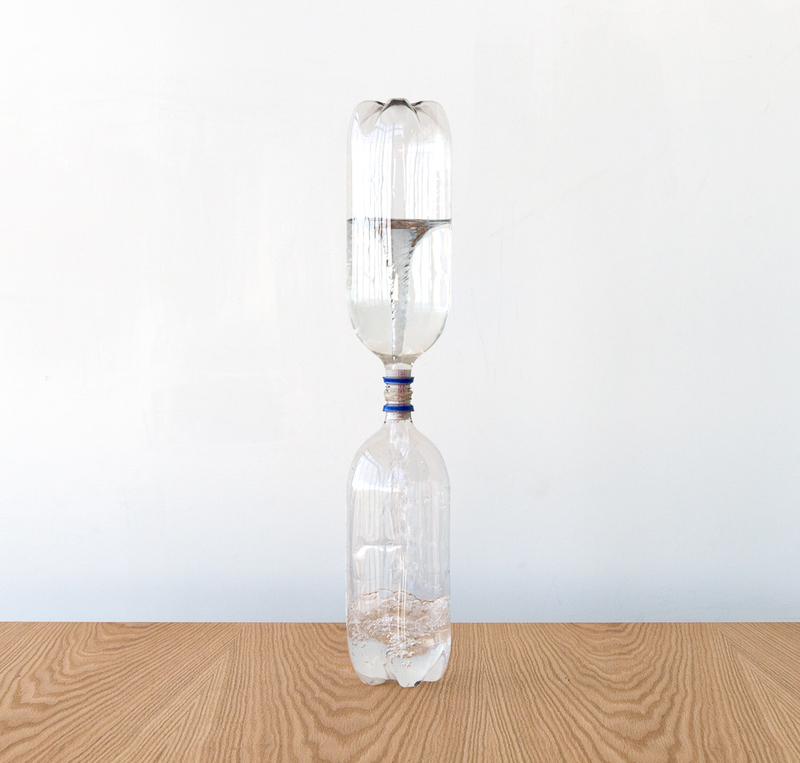 If the top bottle is full, the water can push out a bulge in this surface to form a bulbous drop, which then drips into the lower bottle. As water drops into the lower bottle, the pressure in the lower bottle builds until air bubbles are forced into the upper bottle. The pressure that the water exerts on the surface in the connector decreases as the water level in the upper bottle drops. When the water level and pressure drop low enough, the water surface can hold back the water and stop the flow completely. To make water move in a circle, forces called centripetal forces must act on the water. These “center-pulling” forces are created by a combination of air pressure, water pressure, and gravity. Vortices occur in nature in many forms: tornadoes, whirlpools, weather systems, even galaxies. The essence of a vortex is that objects are drawn together toward the center, then miss! Spiral waves form in the water surface of the vortex. These waves appear to move in slow motion as they travel upward through the downward-flowing water. Rotating water has a curved surface.